I like to display bouquets of succulent rosettes in clear glass containers filled with layers of sand. Practical as well as pretty, the sand lends color and interest, and serves as to anchor the stems so top-heavy rosettes don’t tumble out. A jay appears interested in the spring succulent bouquet I made for the 2018 Super Succulent Celebration. 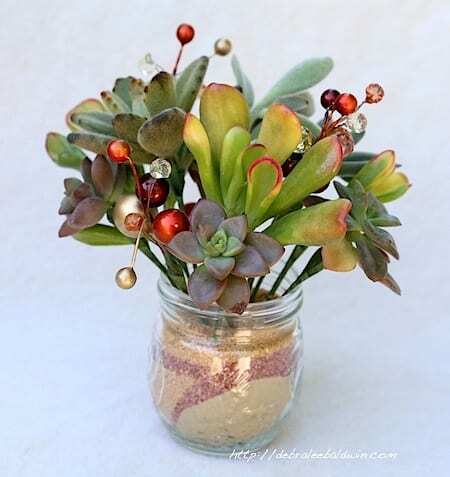 Succulent sand bouquets make quick and original hostess gifts. Moreover, recipients can remove rosettes from their faux stems and plant them, if they like. The inspiration for my spring 2018 succulent sand bouquet (above) was an unusual blown glass vase I found at a thrift store. But any glass cylinder, bottle or jar will work. I keep a palette of colored sand in glass jars on an open shelf so I can enjoy looking at them, even when not using them. Colored sand is available at craft stores and online. This arrangement, which took about 15 minutes to make, is in a repurposed vinegar bottle. And this one was a holiday gift. To make your own colored sand, obtain a bag of playground sand from any home improvement store, plus Rit dye in whatever colors you want (sold in supermarkets and online). The sand looks white but is actually pale gray, but that’s OK, because the resulting muted colors look fine with the plants. To color sand, pour the liquid dye into a pan no longer used for food, add sand to the level of the liquid, and bake until the liquid evaporates—300 degrees for an hour or so. Stir occasionally with a metal spatula or clean garden trowel. Let it cool outside, stirring every so often to expose moist sand and to break lumps. When cool, funnel the dry sand into glass jars and store the excess in ziplock bags labeled with whatever color or mix you used. When making a bouquet, select sand based on the colors of the rosettes (or vice versa). I usually fill the container halfway with three colors, then turn it on its side and rotate it to make swirls, then add more sand so stems will be concealed. Try pushing a stiff wire or chopstick into the layers, along the inside of the glass, to create drizzly Vs. Stunning Succulent Arrangements, my online Craftsy class, includes How to Make a Succulent Bouquet. Use this link to take the entire class (all seven lessons) at 50% of the regular enrollment price—$20 instead of $40.